So this is the sample of my daughter's Baby Shower invite. She had selected the solid card stock: Ocean Tides & Lemon Tart, and I selected the pattern paper: Sweet Pea Polka Blue & Ornate Blue. She also select the invite style: pocket card. There is quite a bit going on with this invite. So, bear with me. The 'blue' shade of card stock is muted, so it looks worn, weathered, antique. The 'yellow' shade is bright, cheery. So, I had a bit of a challenge, but I think I pulled it off. I wanted the invite to look 'innocent' in a yester-year way, not a 'hundred-years-old' way. If you are new to my blog: I pretty much add ribbon and a button (or two) to everything. I added a piece of Ocean Tides twill ribbon to the flap. I felt that a knot or bow in the ribbon was too 'feminine'. So, I tied a 'blue' button onto the twill with some hemp twine. I wanted the flap to have a decorative edge, so I used my Eyelet Border punch. The half-pearls were added last. (That's the part that I don't think my daughter will like.) 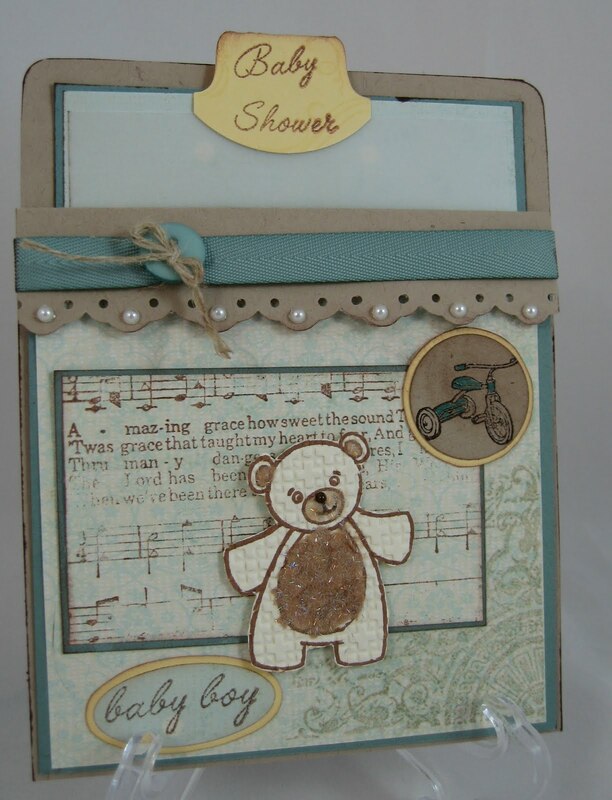 The Live Inspired flourish stamped in the bottom right corner has a 'time-traveled' feel to it. I stamped the flourish in Sahara Sand classic ink. I really didn't want it to be 'seen', just a decorative piece. The Amazing Grace song 'page' I stamped doing the 'finger-tap' technique. I didn't want everything to be legible. I picked that song stamp because it has a kind of innocence to it. The Pedaling Past tricycle was stamped in Chocolate Chip craft ink, and heat embossed with ultra detail embossing powder. After I heat embossed the trike, I felt it needed a bit of pizazz, so I colored parts of the trike with a Bermuda Bay marker. The teddy bear was the funnest! 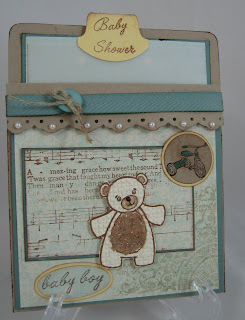 I stamped the bear on a scrap piece of Very Vanilla card stock, using a chocolate brown chalk ink. I wanted the lines to be 'soft'. I then ran the card stock piece through my big shot inside the Square Lattice embossing folder. I thought it made the teddy bear look like it was made out of material. I wanted to add something 'fun' to the bear, so I did! I added Brown Sugar sparkle flock to the bears tummy, inside his ears, and his mussel. I also added a 1mm brown half-pearl to his nose, to help define it. For the pull-out; I matted a piece of Vellum card stock onto a piece of the polka dot pattern paper, onto a piece of the 'blue' card stock. (The invite details will be printed on the vellum.) I edged everything using Close to Cocoa classic ink. I may sponge the edge of a scrap piece of card stock in Bermuda Bay classic ink, or Ocean Tides hybrid ink, so my daughter can see some choices. I want her to be completely happy with this. Thanks for looking, and if you have a suggestion as to how I can improve on this, please post a comment. I am open for suggestions. Remember, this is a sample piece.